... softened by the smooth curved uhpolstered backrest. Available in the finishes oak melange, stained black or oak cenere and upholstered in fabric or leather. 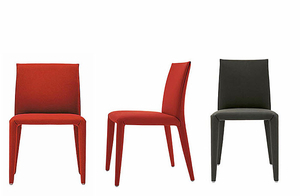 Available in two versions: high and low backrests. An upholstered chair is a seat with or without armrests that has padding and a woven material fixed to it. The material may be synthetic or natural and intended for interior and/or exterior use. On ArchiExpo, this furniture is arranged by properties such as material or style. These chairs provide comfortable seating in domestic and commercial settings, including indoor/outdoor living rooms, terraces, restaurants and offices. Upholstery materials include rattan, leather, silk, cotton, hemp or even PVC. While rattan models are particularly popular for exterior living rooms, absorbent or delicate materials such as silk are generally used on interior chairs. The material may partially or completely cover a rigid frame, often made of wood or aluminum. The chair should be suitable for its intended use. Exterior models may need to be mobile, weatherproof, UV-resistant or have removable covers. Chairs used in busy commercial environments should be robust, stain resistant and easy to clean. Consider maintenance requirements and the relative importance of durability, style and comfort. Style may be chosen to blend in or stand out from its surroundings.